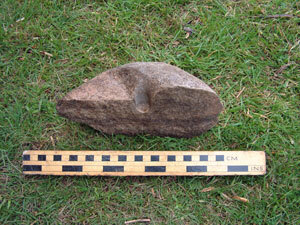 Take a look at the Latest Finds page to see what we have found in the trenches during the past few days. 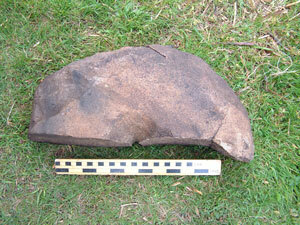 The excavation of Trenches 2 and 5 have produced four fragments of rotary quern over the last three days. The images below show the three fragments found together in Trench 2. The image above shows a complete half of an upper stone complete with the funnel-shaped hopper hole, where grain would have been inserted for grinding. 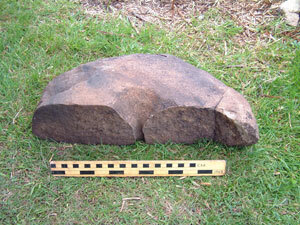 The image below shows the same quern from above to show the overall shape of the item (Scale=0.25m). The image below shows a second quern fragment from a top stone that has broken through the handle hole, that would have been used to rotate the quern. The third quern fragment from Trench 2 is also a top stone that has broken through the central funnel-shaped hopper hole (Scale=0.25m). Excavations in Trench 6, Bone Passage continues to produce a wide range of artefacts including pottery, iron slag, stone tools, antler and bone tools. For this entry I have included digital images of some of the latest antler finds from the trench, for which we now have a substantial assemblage. The red deer antler bases shown above are from shed antler, most likely collected from the landscape surrounding the site. On both pieces cut marks show where the hard, outer layer of the antler has been cut through to reach the soft, spongy interior. 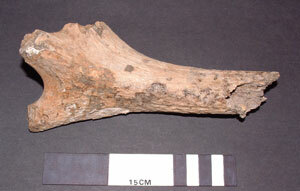 The antler beam has then been broken off. 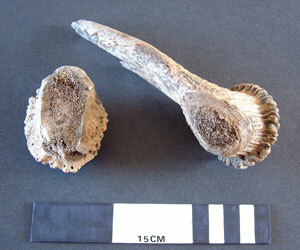 The piece below shows the upper part of antler beam where it splits to form three individual tines, or points. All of the tines have been cut through to detach them, possibly to manufacture tools. 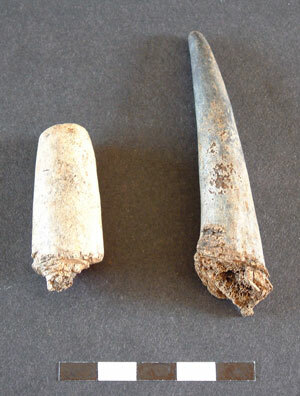 The image below shows two detached antler tine fragments found in the cave, both of which show clear cut marks. 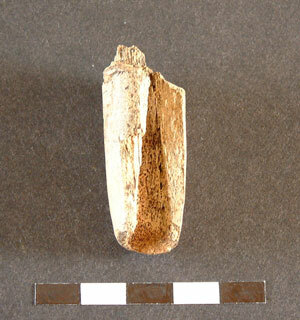 The image below shows the part of the antler beam where it splits to form two individual tines. One of the tines has been carefully removed and the end shaped and polished. The opposite end of the piece has also been shaped and smoothed. 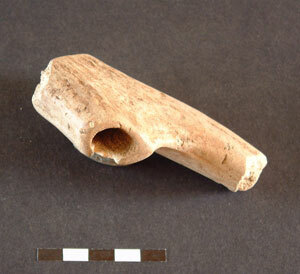 A small hole approximately 12mm in diameter has then been bored through the spongy core of the antler to form some type of handle, or other type of device. The image below shows the bored hole in the artefact. Just found your site. 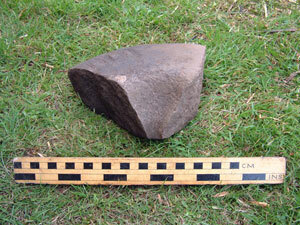 Intrigued by the quern stone finds. Can you identify the rock these are made from? I don’t know if you are aware of some very curious circular markings just above low water mark in the rocks at the easternmost end of Rubha nam Brathairean (about 2 miles S of Kilt Rock). It has been suggested that this might be the site of a former quern stone quarry. The rock there is an alkali olivine-dolerite. Hi Liz. Sorry about delay in getting back to you - computer down. 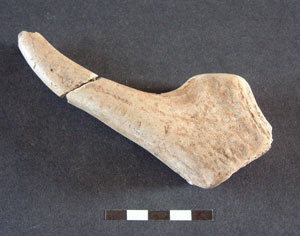 The item on the jet fragment can be found in the finds page for 25th-29th March last. As for the inscribed stone, it was found in a secure Iron age context and had not seen the light of day since the Iron Age. The marks could be the result of use or casual graffiti. Re the jet bracelet, thanks for the comment Martin, of course jet, I know it wouldn’t have been jade! I was thinking the right thing but spelling the wrong thing - trying to do too many things at the same time sorry. I still can’t find a mention of it - I thought it was found in August? I’ve looked back to May in detail but can’t find it. I was very interested in the marked (graffiti) stone. What indications are there (position, perhaps or otherwise? )that the marks are Iron age? Is one possibility modern cavers for some reason? I believe such marks can be very difficult to date. I was particularly intrigued by the stepped edge which appears to be so obviously and distinctly marked- have you any new speculations as to the reason for this?